I don't know about you, but I am always so curious about what skincare products other people use. Maybe that's just me? Well, here's a peek into my skincare routine. If you don't already know, I have very sensitive, dehydrated skin with rosacea. 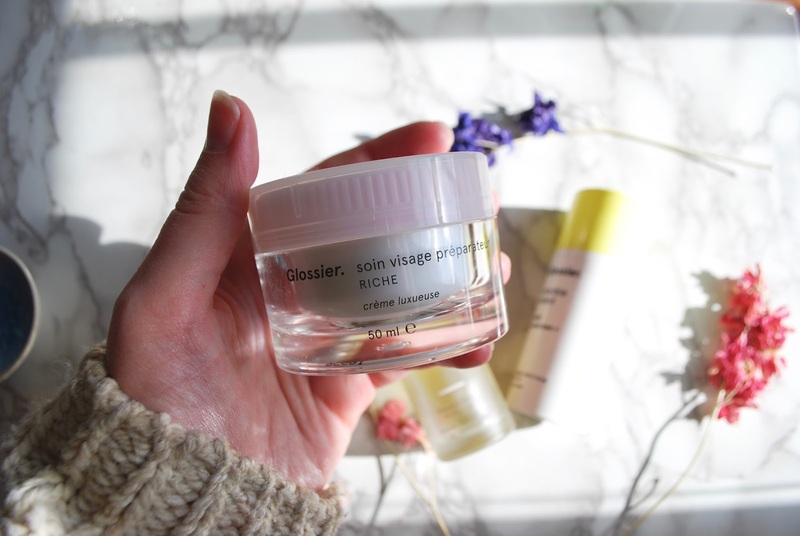 I treat my rosacea using prescription medication (read more about that here if you're curious), but these products help keep my skin moisturised, calm, and protected. A month before our wedding, I went down to London to hang out with my now sis-in-law. While I was there, I took advantage of *not* being in rural Scotland and hit up a spa. I got a facial at the Corinthia and it was amazing. My skin looked so calm, balanced, and moisturised for the next couple days. I decided to buy their Optimal Skin ProSerum, which is really much more of an oil. I use this before my day cream, spreading it all over my face and gently pressing it into the skin. Bonus: it smells incredible. 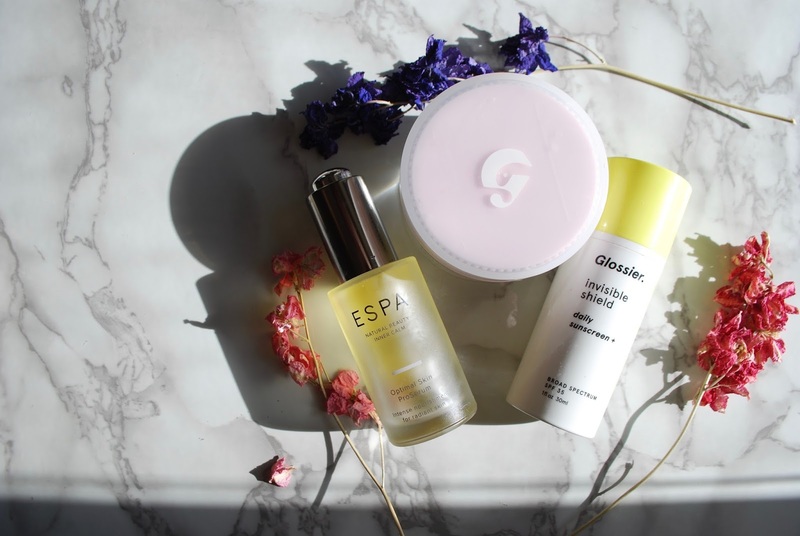 For my everyday moisturiser, I use the Glossier Priming Moisturizer Rich. And hey--they start shipping to the UK on October 9! (I am lucky enough to have an amazing mom who mails me Glossier products from the States--thanks, mom!) This applies best on skin that is still damp from your serum. This has a really calming and subtle lavender scent that doesn't irritate my sensitive skin. When I use this regularly (i.e., when I am not super lazy with my skincare and use this several days in a row), this reduces some of my background redness. Pro tip: do NOT apply more than a tiny amount of this, or it won't sink into the skin and will pill up and come off. If there's one thing that is crucial to my skin not looking like an angry red tomato, it's applying sunscreen whenever I will be exposed to any sort of sunlight--even through a window. Sun exposure is definitely one of my rosacea triggers (meaning, it triggers a flush and rash reaction). I adore this offering--again, from Glossier. 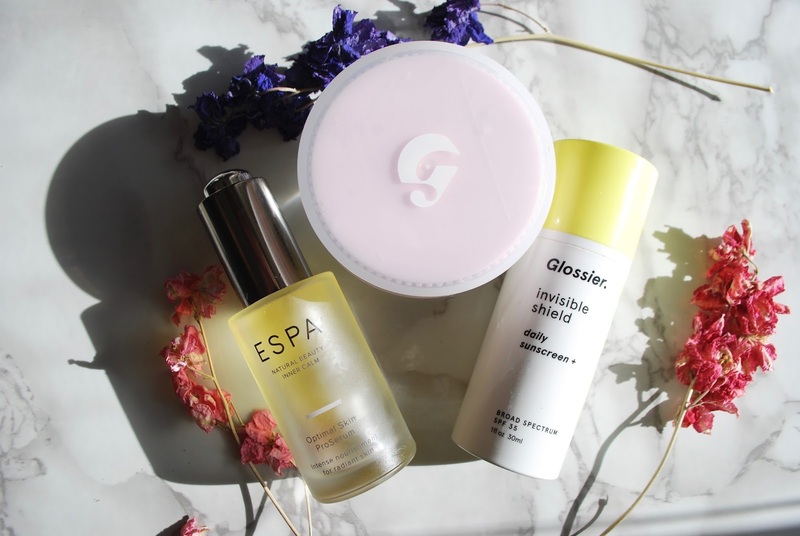 The Glossier Invisible Shield is a clear-ish fluid with SPF 35+. This works really well under makeup, which is crucial, and my skin seems to really like it. Maybe that's because my skin loves anything with Vitamin E? What's your everyday skincare routine? Have you tried any of these products? Sound off in the comments below.